Maltodextrin, PentaPhase®ª Instantized Protein Blend [Whey Protein Hydrolysate, Milk Protein Concentrate (composed of Casein Protein, and Whey Protein), Whey Protein Isolate], Dutch Process Cocoa, Creamer (Sunflower Oil, Maltodextrin, Sodium Caseinate, Dipotassium Phosphate, Monoglycerides, Diglycerides, Soy Lecithin, Sodium Silico Aluminate, Tocopherols), Natural & Artificial Flavor, Salt, Silica, Probiotic and Digestive Enzyme Blend (Lactase, Amylase, Glucoamylase, Alpha-Galactosidase, Cellulase, Protease 4.5, Phytase, Protease 3.0, Invertase, Protease 6.0, Lipase, Bromelain, Lactobacillus acidophilus), Sucralose, Acesulfame K.
For use as a weight gainer mix 2 scoops (1 serving) of TOTAL MASS® with 12-16 ounces of cold water and consume immediately upon mixing. 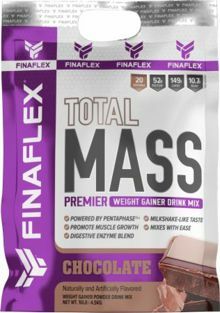 For a thicker more flavorful shake mix with 12 ounces of water. 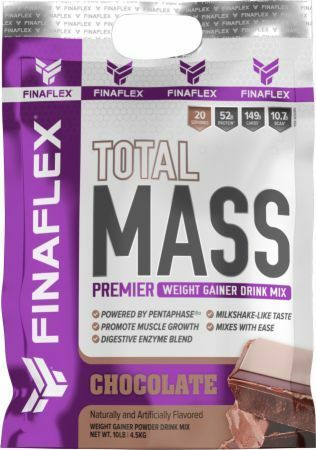 For a thinner, milder flavored shake mix with 16 ounces of water. To increase flavor and macros even further mix with equal parts milk instead of water. Intended for use by healthy adults. Please do not use this product as your only source of daily nutrition. Do not use for weight reduction. Maltodextrin, PentaPhase®ª Instantized Protein Blend [Whey Protein Hydrolysate, Milk Protein Concentrate (composed of Casein Protein, and Whey Protein), Whey Protein Isolate], Creamer (Sunflower Oil, Maltodextrin, Sodium Caseinate, Dipotassium Phosphate, Monoglycerides, Diglycerides, Soy Lecithin, Sodium Silico Aluminate, Tocopherols), Natural & Artificial Flavor, Salt, Silica, Probiotic and Digestive Enzyme Blend (Lactase, Amylase, Glucoamylase, Alpha-Galactosidase, Cellulase, Protease 4.5, Phytase, Protease 3.0, Invertase, Protease 6.0, Lipase, Bromelain, Lactobacillus acidophilus), Sucralose, Acesulfame K.